This huge species is endemic to the Caucasus Mountains and is occasionally cultivated as a curiosity, becoming escaped locally into fields, vacant lots, and disturbed forest edges. 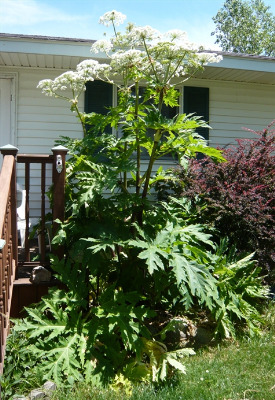 Heracleum mantegazzianum is gigantic, ranging to 4 or 5 m in height, with umbels as broad as 5 dm. This species is dangerous; the stiff, pustulate-based stem bristles are irritating, but the sap is more so, causing serious blistering and burning and even permanent scarring or brown staining of the skin of sensitive persons. The leaves are distinctive, with the apices of all the main lobes tending to be more acuminate than in H. maximum. First collected in 1991 in Ingham Co., though established for much longer in nearby Ontario. 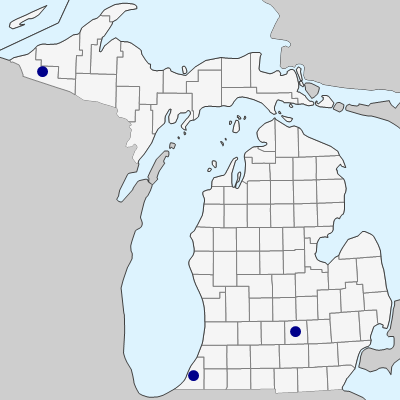 See Rabeler (2002) for more information on the occurrence of this species in Michigan. Part of a species complex in Eurasia, more work is needed to be sure our plants are correctly named. MICHIGAN FLORA ONLINE. A. A. Reznicek, E. G. Voss, & B. S. Walters. February 2011. University of Michigan. Web. April 26, 2019. https://michiganflora.net/species.aspx?id=124.